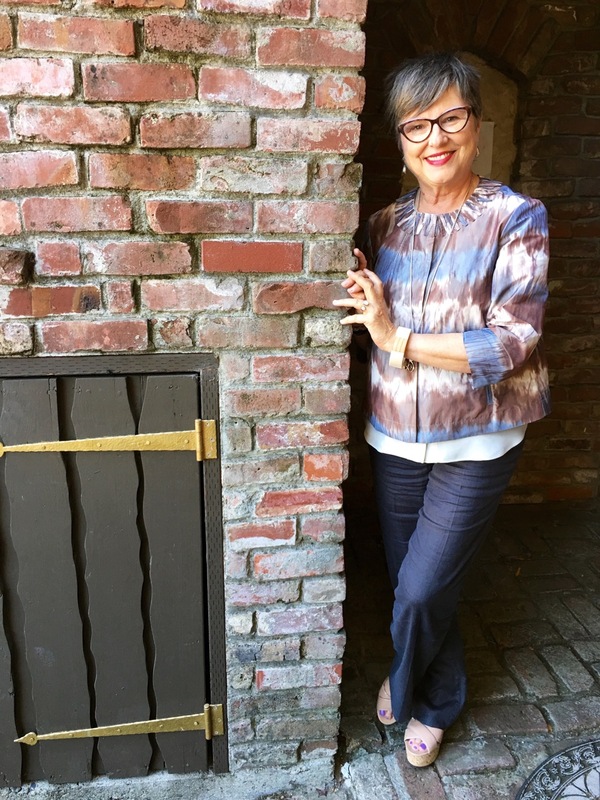 The answer might be that elements of the outfit play on texture, color, a repetition of details, maybe there’s a mix of scale that makes it interesting. It will involve an art principle most likely. Sometimes when I figure it out, I will be influenced to try it on a client the next time I’m styling new outfits from her existing wardrobe. I’ll practice repeating the elements that were at play that caught my eye originally. But sometimes someone appears in a combination that elicits more of a “wow” reaction from me than a “whoa” reaction and I’m breathless! I can barely think at all! What’s the difference between whoa and wow? With a whoa reaction, I am pleasantly curious. I take my time to study and ponder the outfit situation. It’s like sipping a gin and tonic: it doesn’t have to go down quickly. A “wow” response is instant, explosive! It’s like experiencing that first bite of a cookie pulled out from behind the glass case at Della Fattoria Bakery. The first bite has so much flavor to it, the pleasure is instant, and eating the rest of the cookie isn’t even necessary. Your world has been expanded and forever changed by that one incredible bite! Well, that’s how I felt when I was deep in conversation with two friends over breakfast at a hotel where we were attending an AICI conference. That’s when Elena walked toward me and although I don’t remember if it happened this way, my mouth could easily have dropped open and scrambled eggs could have fallen out as my style eyes experienced a “wow” fashion moment. 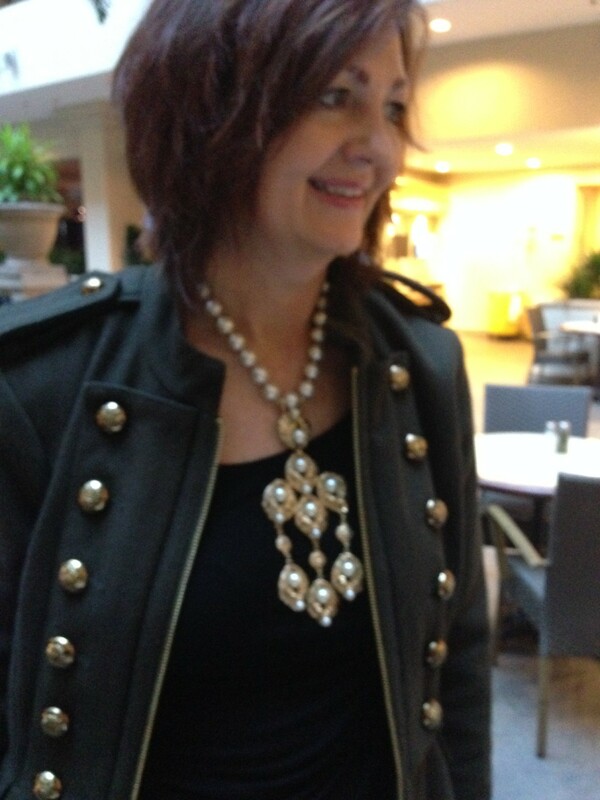 I remember two things: a military jacket and the most amazing pearl necklace I’d seen. It was so bold and magnificent. I knew this much, even though my brain was scrambled in delight: the same way complimentary colors sitting next to each other makes you appreciate each of them more intensely than if they were alone or with other colors, the bold buttons on the the jacket were intense just like the pearls were intense. And I appreciated them both! I really couldn’t tell you much about the rest of the outfit other than the fact that it supported that action that was happening from the waist up. When I study it now, I think that if the military jacket was in a boxing ring with the pearl necklace –THAT pearl necklace– the pearl necklace would win. And somehow that “girl power” thing makes me happy. Coco Chanel would be proud. A week or more must have passed before I thought to ask Elena what had made her put that outfit together the way she did. I certainly had been thinking about it and was hoping she’d remember. 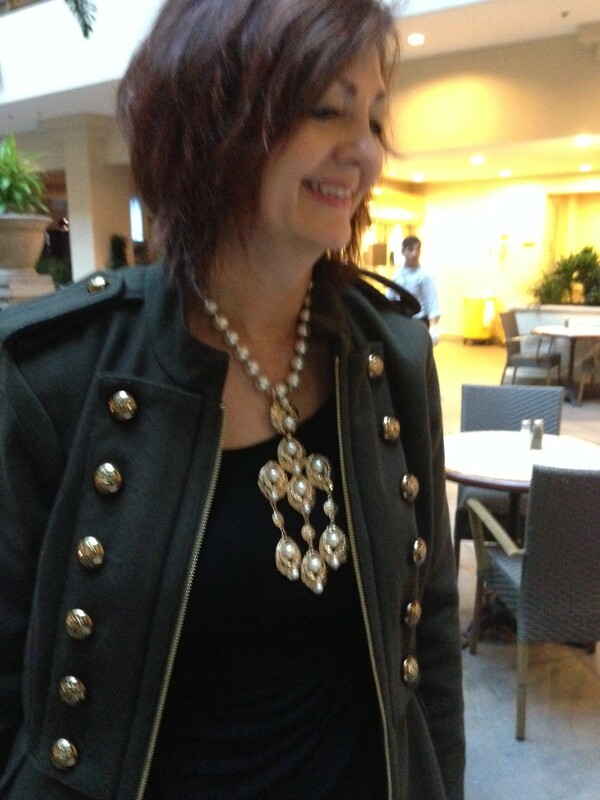 Somehow I just can’t imagine anything but that necklace teaming with the military jacket. But I’m sure Elena will wake up one morning and use one of those pieces in an entirely different way and it will be brilliant. Creative people are like that. I’m just happy I was in the right place at the right time and got to enjoy the impact of her combination of fashion and accessories. Oh good! Now you see how the inside of my brain works. Thanks again for the WOW experience of seeing you that day in those brilliantly chosen pieces. You inspire me! I missed this post the first time around. Thanks for link with a current treasure box post. Despite some time passing–I would jaw-drop in delight at Elena’s combo of a military jacket and pearl statement necklace. I love this look. Remember Elena? She was at the Madelaine Albright brooch exhibit. I’ll be seeing her every day next week and I can’t wait to see what she’s wearing. I’m putting on an event for 18 professionals and there will be so many great outfits every day of the week!